Mega Groudon in game: 124 Who? Important notice! 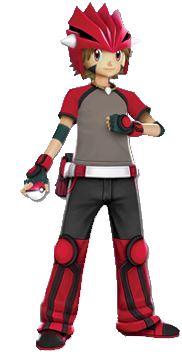 Pokemon Mega Groudon is a fictional character of humans. Groudon (Japanese: グラードン Groudon) is a Ground-type Legendary Pokémon introduced in Generation III. While it is not known to evolve into or from any other Pokémon, it can undergo Primal Reversion and become Primal Groudon if it holds the Red Orb. Groudon possesses the ability to expand continents. In ancient times it came in conflict with Kyogre, a Pokémon with the ability to expand the oceans. 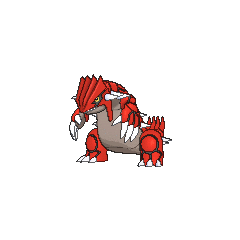 In Pokémon Ruby, Emerald, and Omega Ruby, Groudon is sought after by Team Magma as a major part of their plot to compose more habitats for land Pokémon by lowering the sea level. Groudon is the game mascot of Pokémon Ruby and its remake Pokémon Omega Ruby, with Groudon appearing on the box art of Ruby and Primal Groudon appearing on the box art of Omega Ruby. Along with Kyogre and Rayquaza, Groudon is a part of the weather trio. 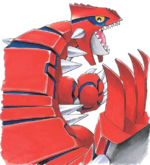 Groudon is a massive, bipedal, dinosaur-like creature covered in red, segmented plates of thick skin that act as armor. It has a gray underside and large white spikes that run along the sides of its head, body, and tail. It has four claws on each hand, four dozer-like blades on the end of its large tail, and three claws on each foot with grey markings under its feet. It also has blue stripes inside the seams of its armor plating which can only be seen when Groudon is glowing with power. 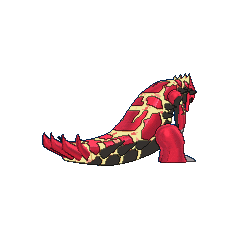 As Primal Groudon, its appearance is similar to Groudon, but larger in size. Its skin color changes from dark red to deep crimson with its underside, spikes, and teeth turning black. The blades on its tail are more separated from one another. The Ω symbol is now shown on its arms. Its eyes, the inside of its mouth, and the now-enlarged openings between its armor plating glow bright yellow, and its irises are now red. The energy that fills Primal Groudon pours forth as magma, and it burns with such an extreme temperature that its body is always shimmering with the haze of its heat. In the anime, Primal Groudon is said to compose new land with every step it takes. Groudon is an immensely powerful Pokémon, having the ability to summon intense droughts and cause volcanic eruptions. The droughts it can cause allow it to evaporate water, while the volcanic eruptions it can summon enable it to compose land. It sleeps underground in large magma chambers. If it encounters its rival, Kyogre, they will engage in a cataclysmic battle. Groudon is the only known Pokémon capable of learning the move Precipice Blades. In Jirachi: Wish Maker, a former Team Magma scientist named Butler, working as a magician at the Millennium Festival, wished to use Jirachi to bring forth a Groudon. However, what he ended up with was not a Groudon, but a manifestation of pure evil that had the appearance of a Groudon. At the end, Jirachi used Doom Desire to destroy the false Groudon. Groudon's first anime appearance was in Gaining Groudon. Team Aqua had captured Groudon but didn't have the correct orb to control it. Team Aqua planned to make a trade with Team Magma, who have captured Kyogre. The trade was about to be made when Archie decided to use Kyogre to destroy everyone, including his fellow henchmen. The battle between Kyogre and Groudon occurred during the following episode, The Scuffle of Legends. In Malice In Wonderland!, a Groudon appeared as an illusion composed by Mismagius. A Primal Groudon appeared in Mega Evolution Special III, where it went on a rampage and battled Primal Kyogre. It reappeared in Cloudy Fate, Bright Future! and The First Day of the Rest of Your Life! in the form of flashbacks. A Groudon and a Primal Groudon appeared in the second XY series movie, Hoopa and the Clash of Ages. It was summoned by Hoopa Unbound along with many other Legendary Pokémon. Groudon made its debut in the opening of Jirachi: Wish Maker. Groudon makes a cameo during the introduction of Destiny Deoxys, The Rise of Darkrai, Arceus and the Jewel of Life and Zoroark: Master of Illusions. 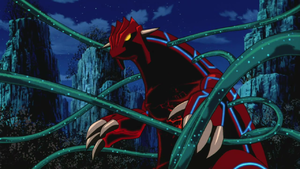 Groudon was briefly seen in Mega Evolution Special II. A Primal Groudon made an appearance in The Vision. It appeared in a vision Courtney had about Team Magma's plans to awaken Groudon, where she envisioned it destroying a chain of islands before attacking Maxie and Tabitha. However, this did not deter her from carrying on Team Magma's plans. 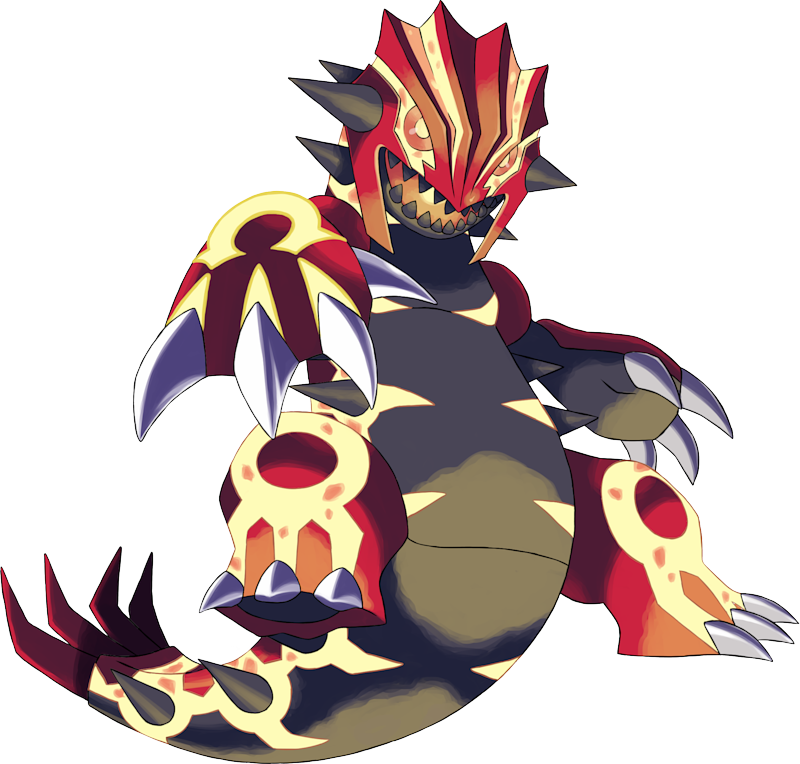 An evil creature resembling a Groudon was the result of Butler's failed experiment in the first Advanced Generation series movie, Jirachi: Wish Maker. Likewise, this false Groudon appears in the manga adaptation of the film by Oouchi Suigun. Awakening Groudon was the main mission of Team Magma, so they could expand the land. Groudon was finally awakened when Team Magma and Aqua formed a temporary truce to be able to go underwater. Wallace, Brawly, and Roxanne tried to stop the Pokémon's advance but failed due to the interventions of Blaise, Courtney, and Tabitha. Eventually, it reaches its destination: Sootopolis City, to battle Kyogre, which it did for days on end until Ruby, with the aid of a reformed Courtney and his own, Rayquaza-controlling father, managed to quell it. Afterwards, it cut its ties with Kyogre and went to resume its slumber at the bottom of Mt. Chimney. It is shown afterwards that this restored the volcanic activities that Team Aqua had earlier annulled. Ryū Tendō owns a Groudon which debuted in ABM10. Groudon appeared in Why I Became a Pokémon. The Answer Finally Revealed!! and Tears and Emotions - It's the Final Chapter!. One Groudon figure has been released. Groudon is obtainable as a Poké Ball Pokémon. It uses Overheat to immolate itself in a fiery aura, causing anyone (except the summoner) who comes into contact with it to be knocked back and receive damage, similar to the attack of Moltres, though it lasts longer. 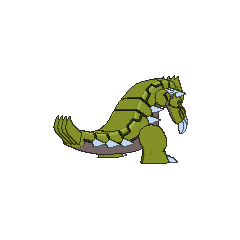 Due to its tremendous size, it takes up a lot of the stage, making its attack almost inescapable. However, Groudon's attack is significantly weaker than Moltres', as it deals less knockback and damage; making it very hard to directly KO an opponent until they reach a very high damage percentage. "A Continent Pokémon. In ancient times, it brought down droughts to save people who had suffered from floods. It is normally found in the profound depths of the earth, where it slumbers in magma. With a mighty roar, it uses Earthquake to mow down enemies. In battle, it summons sunlight to bathe the area. It once had an epic battle with Kyogre." Groudon appears as a trophy. NA: Groudon is called the Continent Pokémon, and that's not just because it lives on them. PAL: Groudon is called the Continent Pokémon, and that's not just because it lives on them. Pokémon Pinball: Ruby & Sapphire: Groudon is the focus of the second Bonus Field on the Ruby Field. Groudon will throw rocks down from the ceiling to add obstacles to the field and compose an eruption to surround itself in pillars of fire. The rocks take three hits to break while the fire pillars take four hits to break. During this time, Groudon will also throw fire balls at the Poké Ball to stall it further. The eruption does break any rocks still on the field. Groudon must be hit 15 times in three minutes to win. After beating the round twice, Groudon will be captured. Pokémon Mystery Dungeon: Red Rescue Team and Blue Rescue Team: When the player completes the Mt. Freeze dungeon for the first time, after Ninetales is spoken to, an earthquake will happen, then Ninetales says that Groudon has awakened, and will wreak havoc. 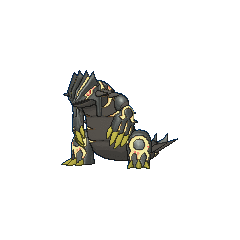 Team ACT will then go off and try to stop Groudon, only to be defeated, then a new team, made up of Blastoise, Golem, and Octillery. When they get defeated, the player's team have to go to Magma Cavern themselves and defeat Groudon. Pokémon Mystery Dungeon: Explorers of Time and Explorers of Darkness: When the player visits Steam Cave for the first time, Uxie compose a fake Groudon, hoping that it would keep the player's team away from knowing Fogbound Lake's existence in order to protect the Time Gear it has been guarding. After the credits, a real Groudon appears in Shimmer Desert as the guardian of the Terra Cymbal. This Pokémon took to sleep after a cataclysmic battle with Kyogre. Groudon has the power to scatter rain clouds and make water evaporate with light and heat. It came as a helper to people who had been suffering from terrible floods. It sleeps in magma underground and is said to make volcanoes erupt on awakening. Legends tell of its many clashes against Kyogre, as each sought to gain the power of nature. 51%-100% HP All the power of the land lies with me! 26%-50% HP I'm incredulous... My health should drop to half? Level up I've leveled up! The infinite power of the land fills me! Groudon appears deep in an ancient relic. Its roars trigger huge earthquakes! Groudon likes the Lava Zone because it reminds him of good old days in the PokéPark. He really packs a punch at Blaziken's Boulder Bash. Sometimes increases damage and leaves opponent paralyzed. For other sprites and images, please see Groudon images on the Bulbagarden Archives. 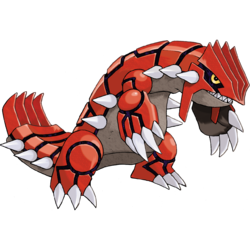 In games prior to Pokémon Omega Ruby and Alpha Sapphire, Groudon has a catch rate of 5. Primal Groudon is the tallest Fire-type Pokémon. Primal Groudon is the heaviest Ground-type and Fire-type Pokémon. Groudon shares its category name with Torterra. They are both known as the Continent Pokémon. Primal Groudon has the highest base Attack stat and base stat total of all Ground-type and Fire-type Pokémon. It also has the highest base Attack and base Defense stats of all Fire-type Pokémon and the highest base Special Attack stat of all Ground-type Pokémon. The fake Groudon in Jirachi: Wish Maker is much taller than its game height of 11' 06", being as tall as the mountainous structures in Forina. When an actual Groudon later appeared in the anime series, it is much closer to its correct size. On the DVD cover of Jirachi: Wish Maker, a normal Groudon is depicted, despite the Groudon in the film not being an actual Groudon. In Pokémon XD: Gale of Darkness, the character Chobin operates a Robo Groudon after the player defeats him for the third time. 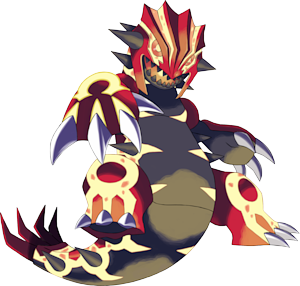 Although Groudon is genderless in the core series games, it is referred to as a male in Pokémon Mystery Dungeon: Explorers of Time and Explorers of Darkness. 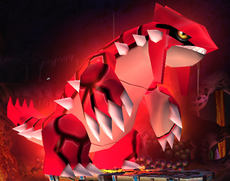 A Groudon costume is worn by Terrell in Pokémon Battle Revolution. Groudon may be modeled after the Earth's land and volcanoes and may be based on the Hebrew legends of Behemoth, the unconquerable primal master of the land. Its counterparts were Leviathan and Ziz. Just as Groudon is in conflict with Kyogre, it was said that at the end of time, Behemoth and Leviathan would start a battle that would kill them both. However, the Behemoth is usually depicted as a warthog/hippopotamus-like creature; in the same way, Kyogre is not based on traditional depictions of the Leviathan. 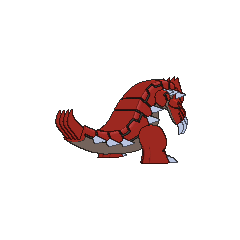 Instead, Groudon resembles a therapod dinosaur in appearance, with spikes resembling various species of Ankylosauria. Groudon may be a combination of ground and don (Spanish for lord). 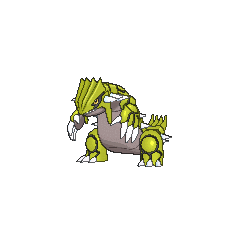 Don also means tooth in Ancient Greek and is commonly used in dinosaur names, which Groudon somewhat resembles. It may also involve 土 do (ground) or ドン don (onomatopoeia for a very loud crashing noise). Mandarin Chinese 固拉多 Gūlādūo Transcription of its Japanese name. 固 also means "solid"